A brief post this week as I have been short of time, however a post that covers two aspects of London that fascinate me. 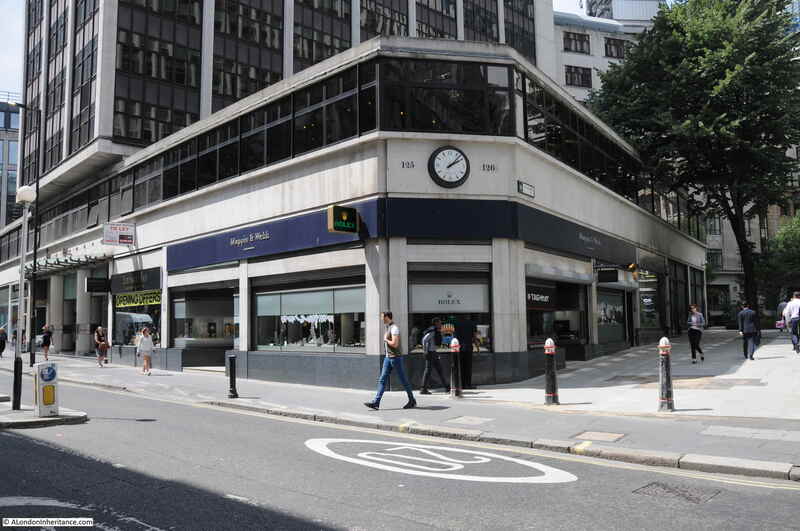 The first is about London’s buildings, the considerable range of different architectural styles over the centuries, how these change, how some buildings survive, the degree of rapid change – Fountain House in Fenchurch Street is a good example. 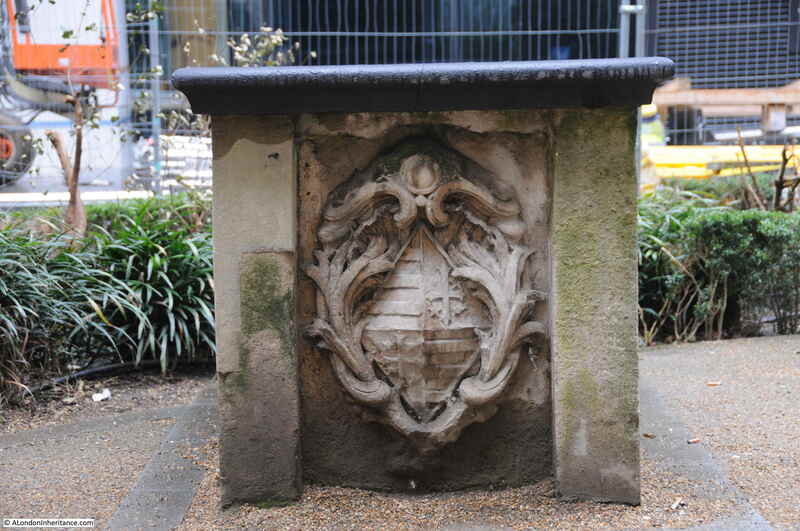 The second aspect are the traces of London’s history that can still be found in a rapidly changing City, and for this, St Gabriel, Fenchurch is an example. I came across Fountain House whilst walking along Fenchurch Street. There is nothing special about the building, however the design of Fountain House is from a specific period. It is the type of building that I expect will soon disappear and be replaced by a much taller glass and steel tower, making full use of the space not occupied by the relatively thin tower. 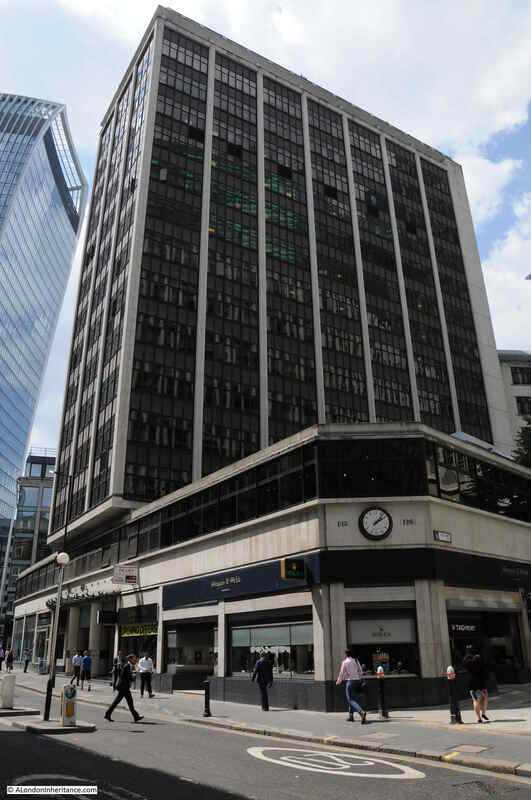 Fountain House was constructed between 1954 and 1958 to a design by W.H.Rogers and Sir Howard Robertson (Consulting). It was the first London building constructed to the tower and podium formula where a large podium occupies the full area of the plot of land, with a much small central space occupied by a tower block. The lower podium block is occupied by a central entrance foyer and around the street level of the podium there is space for a range of retail units. The corners of the podium are almost triangular in shape to fit within the surrounding streets. As the central tower only occupies a small percentage of the overall plot of land, today’s developers would no doubt consider this to be wasted space and a modern replacement would see a glass and steel tower occupying the full width and depth of the land available. This is the view of the corner of the podium, which faces to the east. The clock makes a good central feature to the corner of the building. A walk down Mincing Lane provides a view of the width of the tower to the street, only three bays wide. 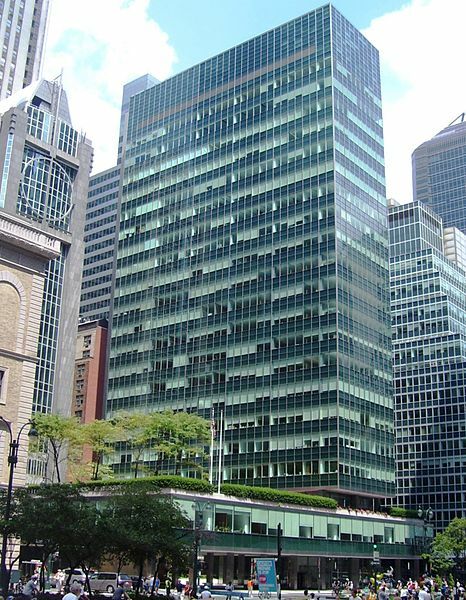 The Lever House in New York, referred to by Pevsner is shown in the photo below. 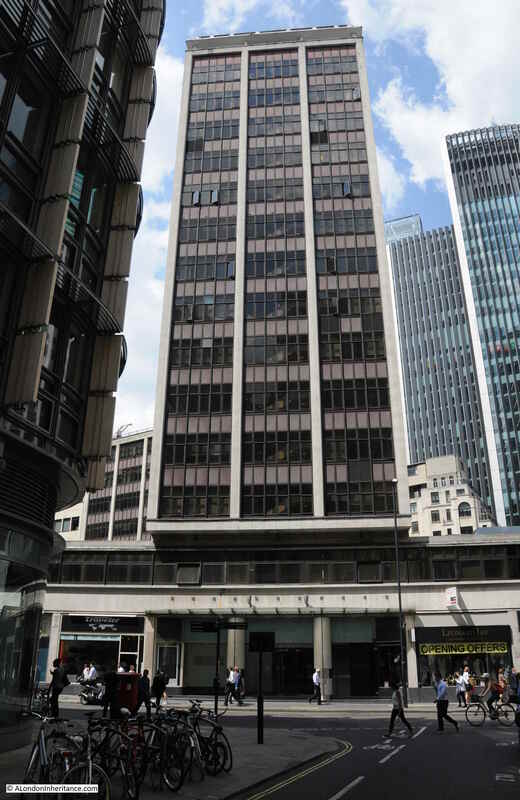 The same concept of podium and tower that would be repeated a couple of years after Lever House was built in 1952 in the City of London with Fountain House. 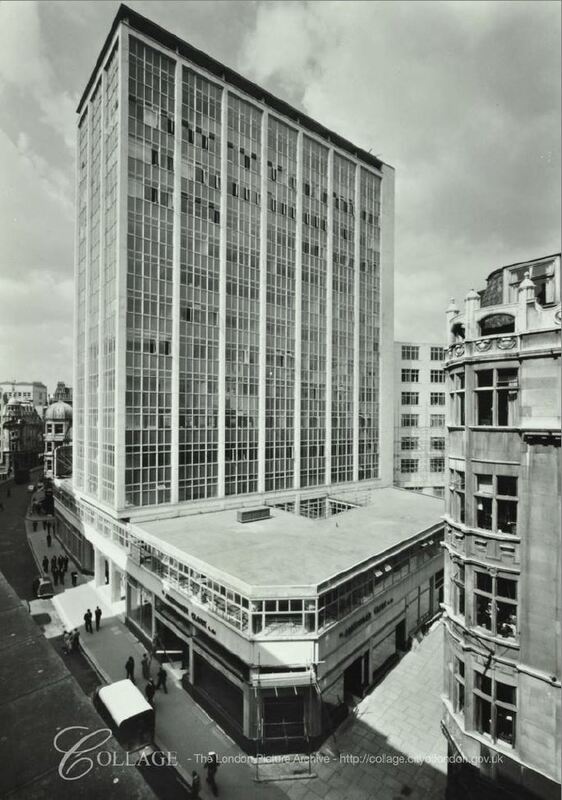 In the late 1950s, Fountain House must have appeared to be the latest architectural style transferring from New York – the City of London rising from the destruction of the war. The two pillars can be seen in the 1957 photo, however I suspect the canopy was a later addition. Always on the look out for plaques attached to buildings, I found the following fixed to Fountain House along the side of the building facing onto Fen Court. 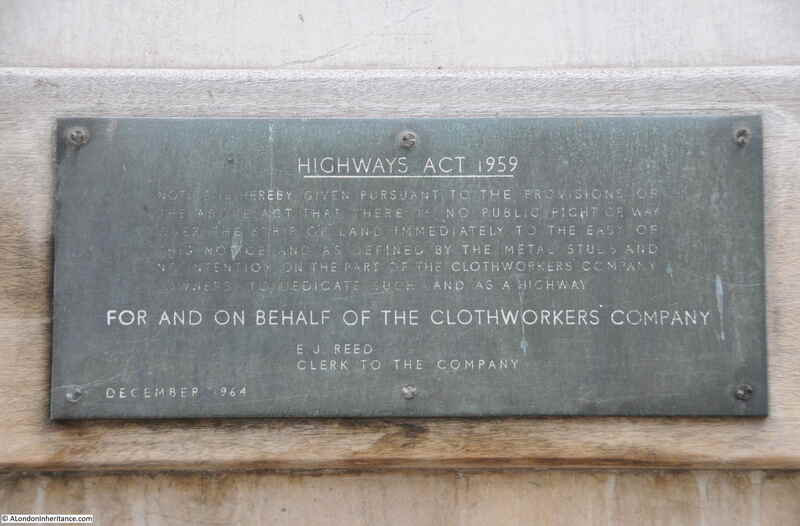 The plaque from December 1964 marks the boundary of the site with the implication that the land belongs to the Clothworkers Company (who have their Hall just to the south of Fountain House). 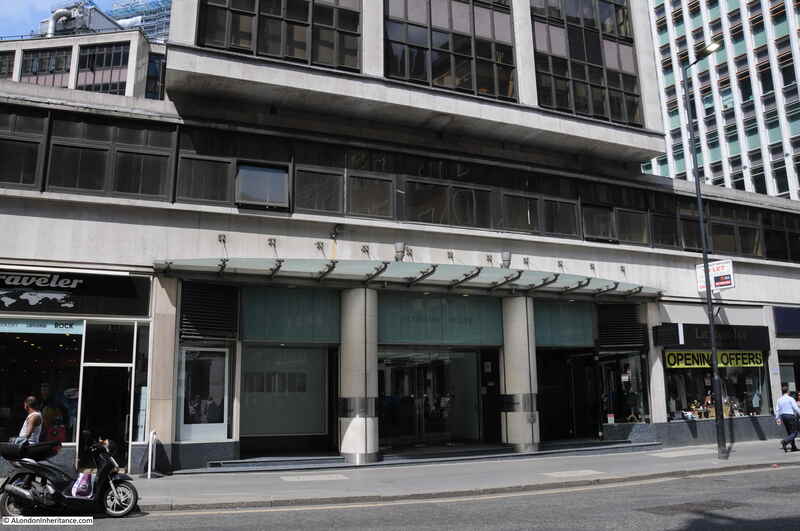 The Clothworkers Company do indeed still own the freehold to Fountain House. 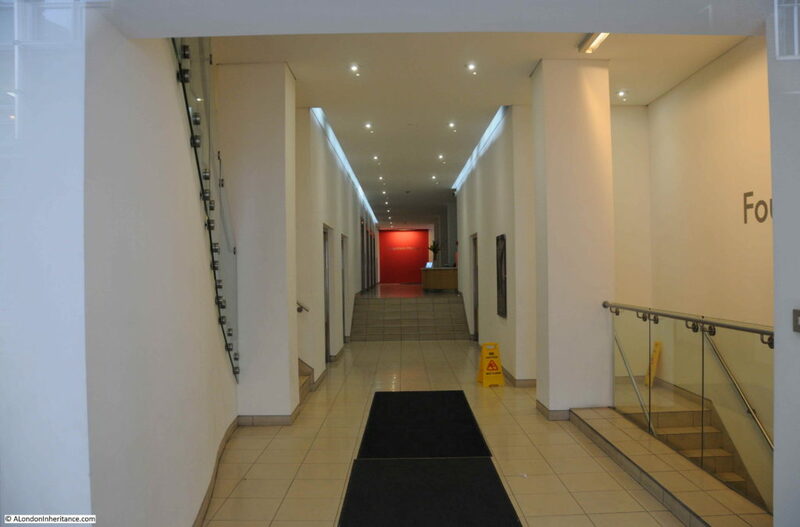 So what is the future for Fountain House? This first example of podium and tower architecture in the City of London may not be around for too much longer. A development agreement is in place between the Clothworkers Company and the tenant of the building for a major redevelopment of the site. 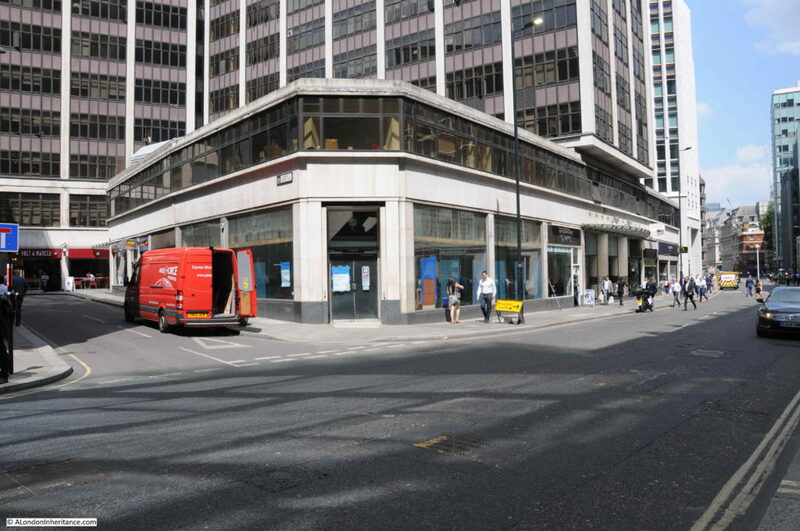 Fountain House will be replaced by a new block which occupies the whole site and makes use of the empty space above the podium, not occupied by the tower. The new building looks to be very much like any other glass and steel tower to be found across the City. The tenant can commence development from 2017, so I suspect this will happen when the financial case for a new office block makes sense to the tenant. A shame as I rather like Fountain House. 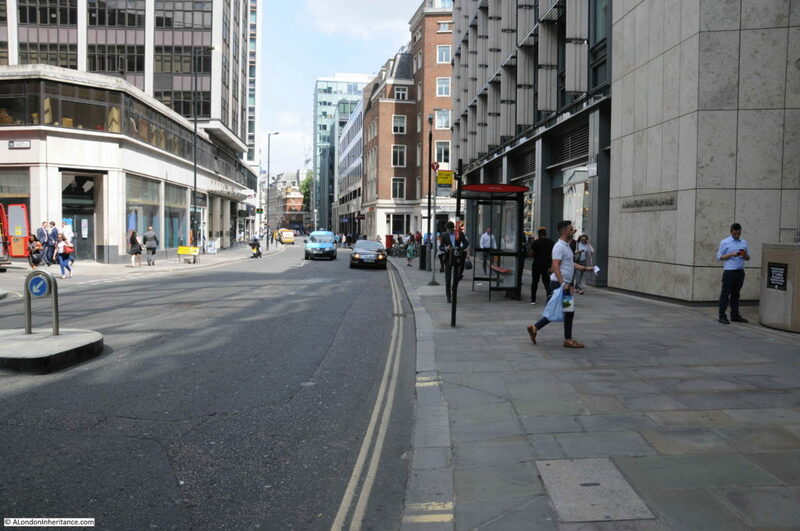 The following photo is the view looking east along Fenchurch Street. Fountain House is the building on the left. Look to the right of the photo and there is a blue plaque. This records that the church of St Gabriel Fenchurch stood in the roadway opposite, so would have been in the centre of the photo above. 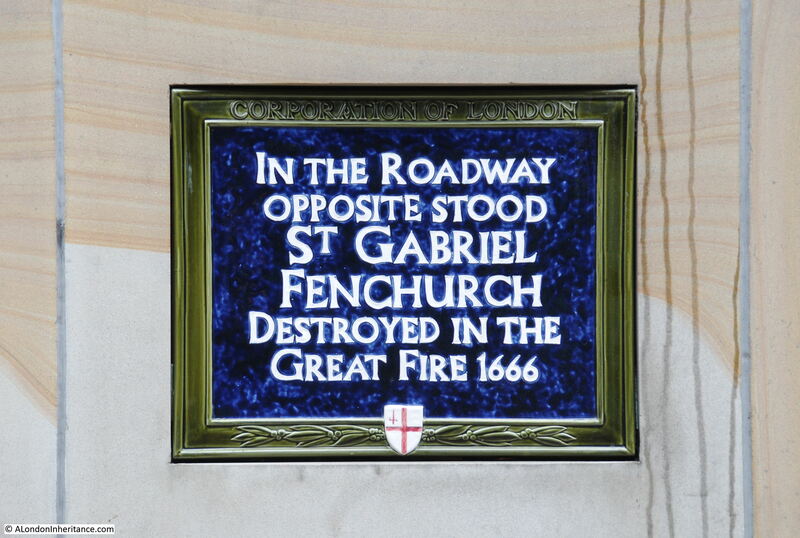 St Gabriel Fenchurch was one of the many City churches destroyed in the Great Fire of 1666 and not rebuilt. I have not been able to find too much about the church. There are no prints of the church in my books on London churches and history or online (that I could find). “The church of S. Gabriel, Fenchurch Street, formerly stood in the middle of the street, and was built not later than the fourteenth century. Before 1517 it was known as S. Mary’s and some time ‘All Saints’. Possibly there was a triple dedication. Corruptly it went by the name of Fen Church and gave a name to the street. The district may have been marshy, for the brook, the Langbourne, went through it, and Langbourne Ward is still in evidence. The first rector was John Payne. 1321. The church was a small one, but was enlarged in 1631. In the Return made in 1636 the income of the rectory, including the house, was stated to be £131. This house, with the garden and graveyard, was the gift of H. Legges. R.Cook, who was rector during the Civil War, was ejected for his loyalty in 1642, but was reinstated at the Restoration. Much the same description is given in the 1771 edition of Chamberlain’s Survey of London, so all the descriptions of St Gabriel’s provide a consistent view of the church. 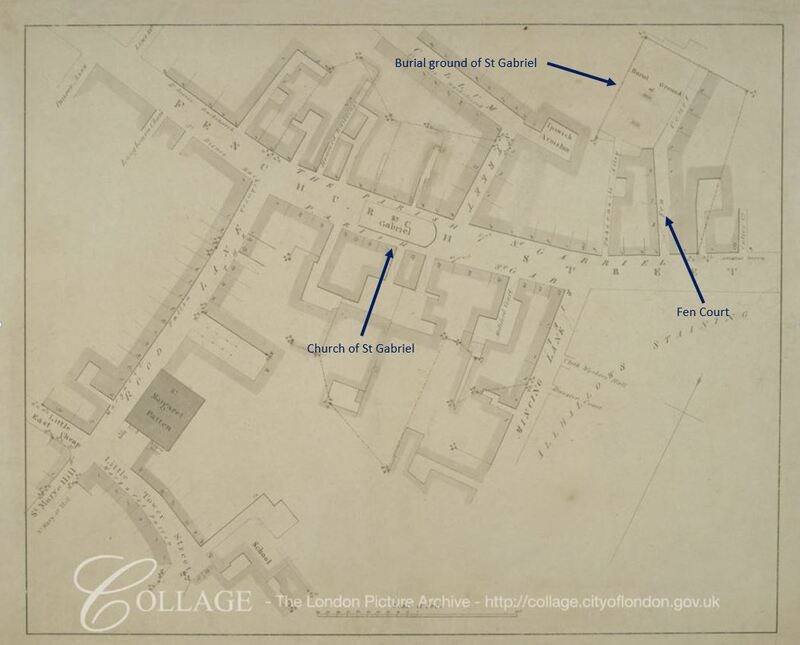 The Collage archive at the London Metropolitan Archives has a map which shows the location of the church in the centre of Fenchurch Street. The strange thing about this map is that Collage dates the map as c1800 which is 134 years after the church was destroyed in the Great Fire. The map shows the position of the church, and also the burial ground of St Gabriel, part of which can still be found today. Fen Court is shown on the map leading from Fenchurch Street to the burial ground. I mentioned Fen Court earlier in the post, and it still runs from Fenchurch Street along the eastern edge of Fountain House, to where the remains of the burial ground can be found. The text illustrates how churchyards and burial grounds from churches not rebuilt would be taken up by other local churches. This contributed significantly to the long term survival of these patches of land in a City ever hungry for additional growth space. The remaining graves appear to be from the 18th and 19th century. Nothing from the time of St Gabriel which is not a surprise, and I suspect burials ended in the 19th century as happened across the majority of City burial grounds and churchyards as after centuries of taking the dead of the City of London, they were over full and a serious health hazard to an expanding City. Which appears to have been built in 1762 by Anne Cotesworth as a burying place for herself as she was born in the parish and her nearest relations were buried in the next vault. 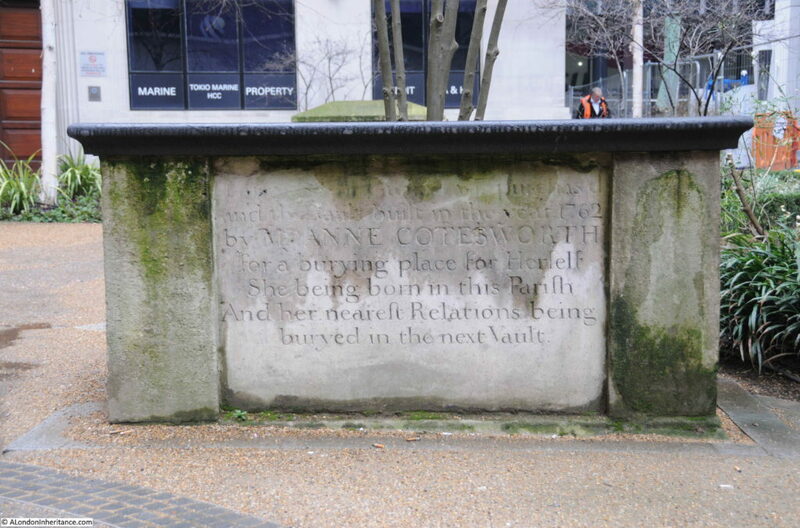 The remains of the burial ground of St Gabriel Fenchurch are immediately behind Fountain House. Hopefully this reminder of a long lost church will not be impacted by any redevelopment. Fountain House is a reminder of how architectural styles change so quickly across London. Once the first example of a new design imported from New York. Sixty years later, and it may well be disappearing in the next few years – and London continues to evolve. 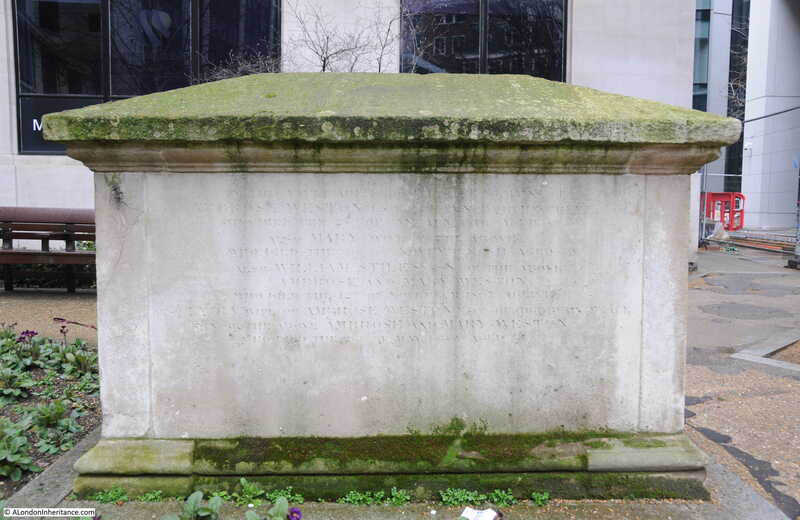 This entry was posted in London Buildings, London Churches and tagged Fenchurch Street, Fountain House, St Gabriel Fenchurch on July 22, 2018 by admin. I have long thought that buildings of the podium/tower design (like your example) retained a certain style, maybe even an elegance. However, because they usually tend to be from an era when build quality and materials were not as effective as in later times, as a Property Manager/Maintainer I normally found them a nightmare! Thanks for this piece. As Fountain House is a rarity & quite an early one, is there no chance of having it listed? After all, No. 1 Poultry is said to have been listed & that is controversial! I like this design with it’s single storey st of shops with clock topped by a narrow office bloack. I live on a podium-tower estate in the City and from a residential point of view it works very well. Visitors are amazed at what we have and at the whole concept; I often take people round. 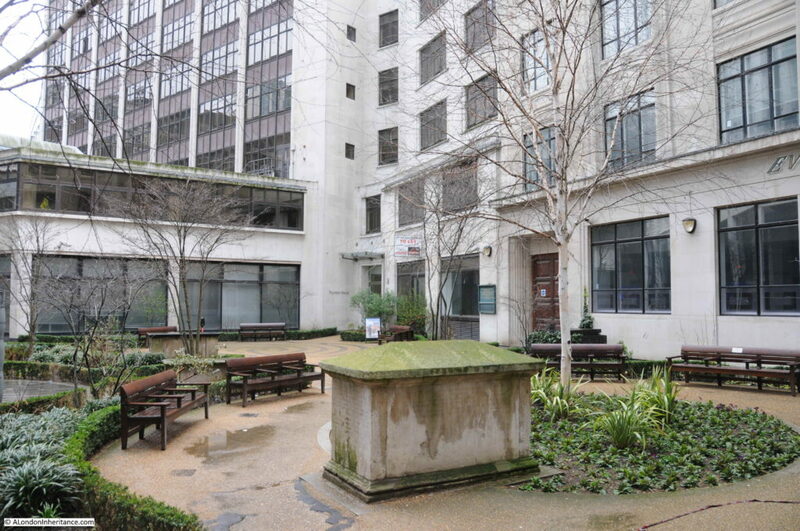 At podium level we have a large private garden, amazing for an estate in central London. Wow, that sounds amazing. I know a lot of the City but can’t think where this would be. It’s the Middlesex Street Estate, not far from Liverpool Street Station. Another fascinating article, thank you. As always, it is a reminder that the history of London is both up above the shops and down beneath our feet, in the form of ancient burial grounds. What an interesting post! Such a shame about Fountain House though – it seems like there should be a way to renovate it so that it doesn’t lose its unique and historic style. At this rate, there won’t be much of historic London left, which is sad because I think that’s what makes the city so interesting. As you say – hopefully the plaque to that church will stay untouched because it adds a lot of character to this area.